As one of the most common areas for liposuction, the abdomen requires rigorous care and attention to detail. In order to provide natural contours and smooth lines, Dr. Amron uses a gentle and highly conservative approach to eliminate fat in the abdomen. By considering all factors of your individual case, he ensures that your results are completely unique to you, providing among the finest abdomen liposuction Beverly Hills has to offer. Further, Dr. Amron also focuses on the abdomen as it compares to the rest of the body. By doing this, his technique is geared towards an overall proportionate appearance. All in all, if you’re looking to reduce your waistline and diet and exercise have not done the trick, abdomen liposuction may be the key to the figure you deserve. The abdomen is a very gravitationally prone area, and I can approach it in one of two ways. First, the upper and lower abdomen may be done as a unit. In many individuals, if only the lower abdomen is done, the upper abdomen will not tighten from the liposuction and gets looser with time. As with every procedure Dr. Amron delivers, abdomen liposuction is done with minimally invasive tumescent liposuction. This means that during the entire procedure, only local anesthetic is used. You are not knocked out, and the procedure leads to faster healing and superior results. Abdomen liposuction must be tailored to the specific needs of each patient and must take into account many details to ensure optimal results are achieved. Click the button below to view Dr. Amron’s abdomen liposuction before and after pictures. In order to properly treat the entire central abdomen, Dr. Amron addresses all four quadrants of the abdomen. In this way, the treatment is consistent through the entire stomach. When only one area of the abdomen is treated, the untreated area may bulge over time, leading to an uneven and disproportionate appearance. Because Dr. Amron treats the entire abdomen as a single unit, it leads to long-lasting tightened contours. In certain patients who have fat deposits around their waist, the circumferential torso liposuction technique will be more beneficial. If these patients were to receive only central abdomen liposuction, it would lead to a wide and flat look. In order to properly deliver circumferential torso liposuction, Dr. Amron has his patients lie on their side with their back perfectly straight. This gives him the best possible access to the waist. By approaching the entire waist from access points above and below, Dr. Amron’s dynamic and comprehensive approach can adequately address any unwanted pocket of fat in the central abdomen, flanks and waist. 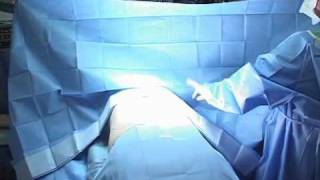 Liposuction is not a procedure that a patient simply walks in and receives. It requires a comprehensive evaluation, analysis and preparation. Dr. Amron's approach is methodical and uniquely tailored to the needs of each patient. Click the button to read Dr. Amron's 10 guidelines for successful liposuction. When patients come to Dr. Amron for his Los Angeles abdomen liposuction, they get the expertise of a seasoned liposuction specialist. In the interest of providing you with the best results possible, he takes an active approach towards your successful treatment. Rather than mechanically performing any procedure asked of him, he conducts his own thorough examination to determine exactly what you need. He then listens thoroughly to your cosmetic goals. By combining his professional viewpoint with your own needs and wants, he can create a personalized treatment program that is specific to you. If you are one of those people looking for liposuction, consider Dr. Amron. In the interest of providing you with the best results from abdomen liposuction, he uses a unique, multifaceted approach—he doesn’t seek to simply treat a single area of fatty tissue. Instead, his goal is to bring proportion and balance to your entire body by considering how each component visually interacts. This dynamic, integrative approach is what sets Dr. Amron apart. To find out more about abdomen liposuction, please call us today.